Mazzuca Contracting’s goal on every project is to get involved early in the construction process by working with the design team in the very initial stages of design development. It is our experience that introducing a contractor’s perspective early in the pre-construction phase provides our clients with the highest quality product at the most economical cost. Mazzuca Contracting closely examines each prospective project location to determine suitability for use, ADA and environmental issues, configuration and scale issues, and MEP & building code requirements. Working closely with the design team as a fully integrated team member, Mazzuca Contracting provides a detailed written report with digital images to flag potential problems. This report then serves as a working model for a successful project once construction begins. Time is money. Mazzuca Contracting provides turnkey services with respect to obtaining permits and mitigating potential delays due to zoning and building code criteria. As a general contractor specializing in commercial construction, we operate throughout the country, building relationships with a multitude of building departments, who respect our integrity and knowledge of building issues. Our aggressive approach to permitting allows us to eliminate any costly delays that can prevent a project’s from success before it even starts. 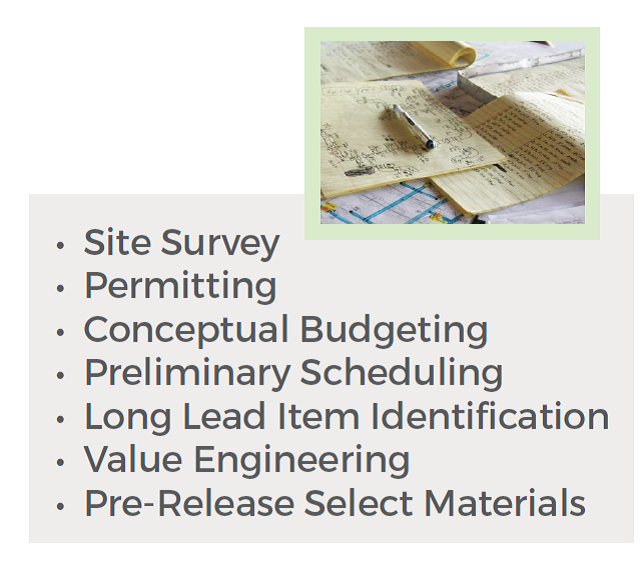 During the design phase, examining methods and materials of construction to determine the most economical approach to your project will save both time and money. Utilizing our database of cost information, in conjunction with subcontractors who are experts in their respective fields, Mazzuca Contracting will analyze every aspect of your project to determine where inefficiencies may exist and offer innovative solutions to your budgetary problems if they arise. Mazzuca Contracting will produce a bar chart schedule using Microsoft Project© detailing both the pre-construction and construction phase. These schedules indicate critical milestones for the design and construction team. The schedule will be continually updated and monitored frequently to show any effects of the permit process and long lead items to avoid potential delays. The schedule will transition through the pre-construction phase and continue to be used throughout construction. Mazzuca Contracting will assist our client and project team in reviewing project materials and systems and identify any potential long lead items that could cause scheduling problems or delays in the projects completion date. In conjunction with the design team, Mazzuca Contracting will review the specified building materials and systems and suggest alternatives for both cost and time savings. Every effort is made to maximize the value of the building without compromising the aesthetic look and technical requirements of the finished product. Mazzuca Contracting’s solid financial condition allows us to pre-purchase and expedite long lead items to avoid delays and ensure the receipt of materials within tight schedule restraints.